Recently I won a Bajaj air fryer in Mother’s recipe contest and shared the pictures on my Facebook & Google plus pages.Some of my readers told me to post some airfryer recipes.I tried french fries,Bitter gourd chips,Lady’s finger fries and bread rolls in my air fryer.Everything came out very well but I couldn’t post them here as everything vanished even before I click .Yesterday evening I tried vegetable Spring rolls using store bought spring roll pastry sheets for the first time.I baked a few in air fryer and deep fried the remaining to compare the results.I prepared a simple and easy vegetable stuffing using cabbage,carrot and capsicum.I made everything quickly and finished clicking before Raksha and Sendhil came home .Believe me,I loved the air fryer version more than the deep fried ones.Air fried ones were very very crispy compared to the other .Moreover its crispness was maintained for long time.Sendhil came 2 hours after I made the spring rolls.Even then they were crispy.I think you can make the same using convection oven too. I was very happy that I served him a low calorie,oil less evening snack recipe.Friends,if you have any plans to buy an air fryer,just go for it without any hesitation .I am sure you won’t regret for the buy.These spring rolls can be served as a starter for small birthday parties and family functions.Everything can be prepared ( including rolling) well in advance and refrigerated.So here you go,my first recipe using air fryer – Crispy Veg Spring rolls ! 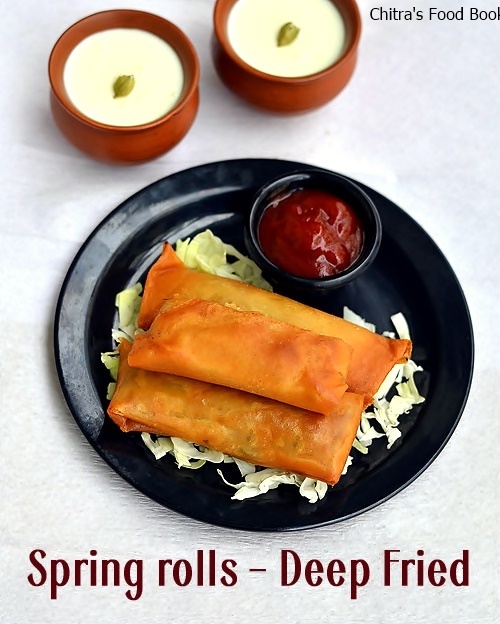 Vegetable Spring rolls recipe - Yummy starter recipe!! Take out the spring roll sheet from the freezer and keep it outside for 1 hour.In the mean time,prepare the stuffing part. Grate the cabbage thinly.Chop the carrot and onion into thin strips.Slice the capsicum thinly.Chop the ginger and garlic very finely.Make sure everything should be of same size and thickness.Try to chop them as thin as possible to ensure quick cooking. Heat oil in a kadai and saute all the chopped vegetables adding some salt and sugar. Sugar helps to maintain the color of veggies.Saute in high flame continuously for 2-3 minutes.Veggies would get cooked and reduce in quantity.Lastly add the soya sauce and pepper powder.Mix well and switch off the flame.Garnish with finely chopped spring onions if u have.Stuffing for the spring roll is ready. In a wide bowl, take the maida or corn flour and add some water to make a cream like paste. Now the spring roll sheet must be ready to use.Take a sheet and cut into 4 if you want to make small sized spring rolls.Cover the remaining sheets with a wet cloth to avoid drying.If you want big spring rolls as in the picture,no need to cut the sheet. Place a tbsp of stuffing in one corner of the sheet.Roll it tight and fold the sides as shown in the picture.If you don’t roll it tight,spring roll becomes flat. Apply the corn flour paste in the other corner and stick it.Repeat the same process with all the sheets and arrange them in a plate. 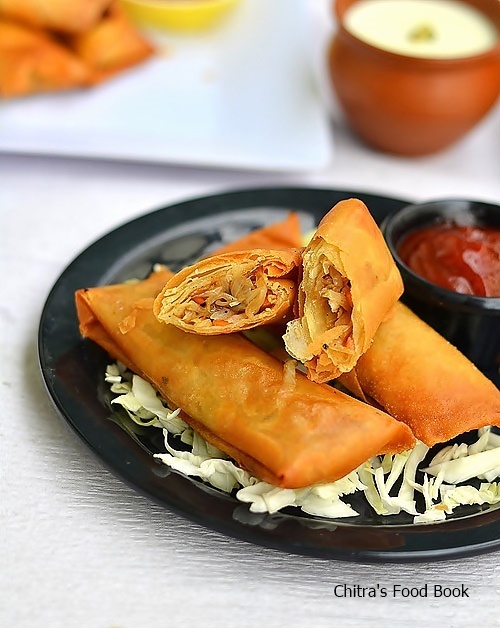 Heat oil to deep fry.Put the spring rolls and cook them in medium flame till they turn golden brown.Turn it whenever needed.Remove in a tissue paper and serve with tomato sauce. Enjoy ! 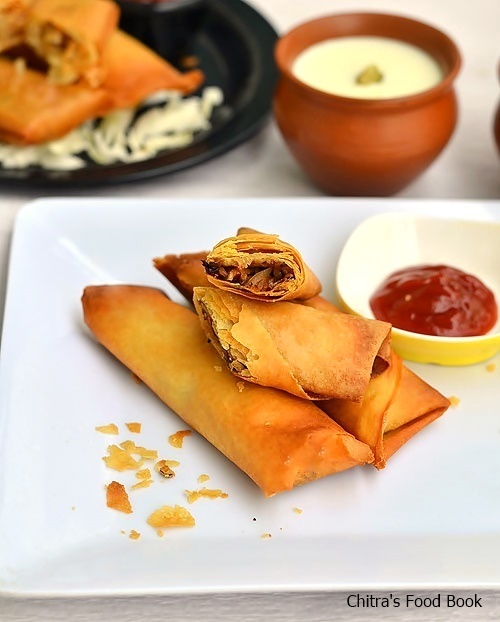 Preheat the air fryer in 180c for 5 minutes.Roll the sheets as mentioned above and arrange them.Brush the spring rolls with some oil.Place the sheets in the Air fryer basket. Set the timing to 20 minutes and temperature to 180c.Bake it for 10 minutes.Remove the basket and flip the spring rolls to bake the other side.Bake for the remaining 10 minutes and check the color of spring rolls.If it remains white,bake it for another 2-3 minutes or more.Remove and serve hot ! 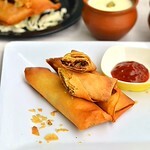 It stays crispy for long time.So you can store the baked spring rolls in the air fryer basket till you serve. Do not keep less stuffing and roll it tight.Keep the stuffing according to the size of sheet. To make the stuffing more spicy ,add some chilli sauce. Jain readers can skip the onions,garlic and use more cabbage.There won’t be much difference in taste. Try this kids friendly starter recipe this weekend and enjoy your tea time ! Oh tat's great Swathi :) Do try it n share your feedback too.Thanks. Too crispy .Really a bliss for people who want to avoid deep frying. My favourite Chinese snack.. It has come out so crispy ! 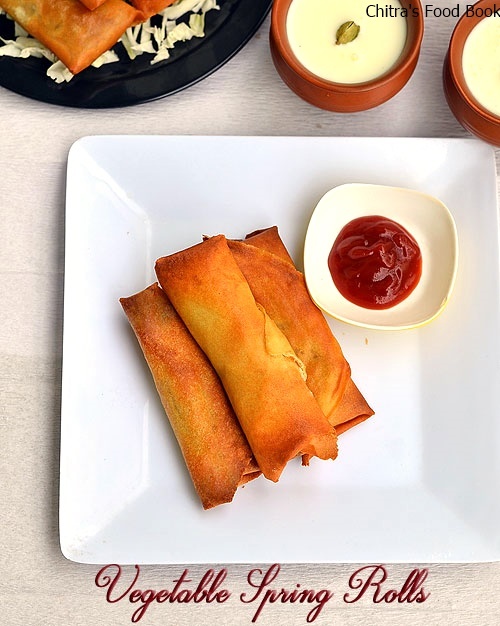 Thank's for sharing Vegetable Spring Rolls Recipe. a healthy option to deep-frying applying gas. 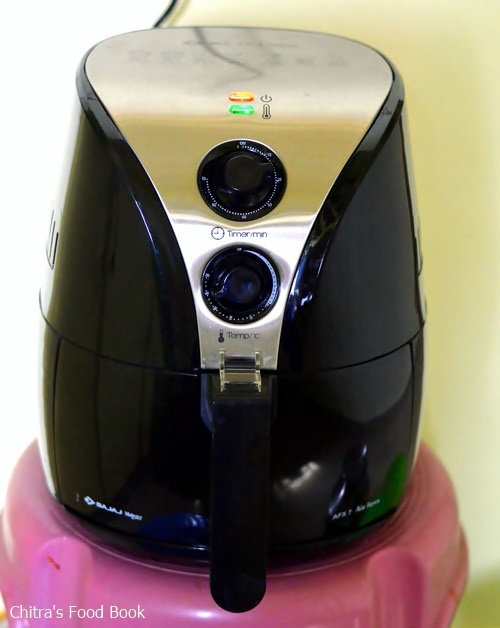 Hot air fryers make use of excited air rather than very hot gas to help make meals meals. A trendy label of this heat stove that makes use of this preparing container may be the Philips heat fryer. You will discover a couple of versions readily available in the usa, this manual heat stove and also HD9230/26 electronic digital version. please visit Air Fryers I hope you will get enjoy. Great recipe....l agree with other reviews that it could be tweaked for more intense or different flavour but it is a nice recipe that the whole family would enjoy. I use philips airfryer to fried them and they were delicious and crispy. Which brand of wrappers did u buy ? are the sheets made up of rice flour or tapioca? i couldn't find the wrappers ? from which super market did u get them chitra ? I bought these wrappers from a store nearby my house.You can find these wrappers in bigbazzar.Nilgiris & total superstore in Bangalore.I don't remember the brand name,sorry.I will try to find out and update the post. Tried the air fryer method today and have been receiving rave reviews . Thank you ! What is the measurement "no"?